Are you a light sleeper fed up of lying in bed on a warm night while a loud fan buzzes away? Or maybe you just want to push out the warm, stuffy air of summer with a crisp and cool breeze of your own? If either of these are the case – then you need look no further. 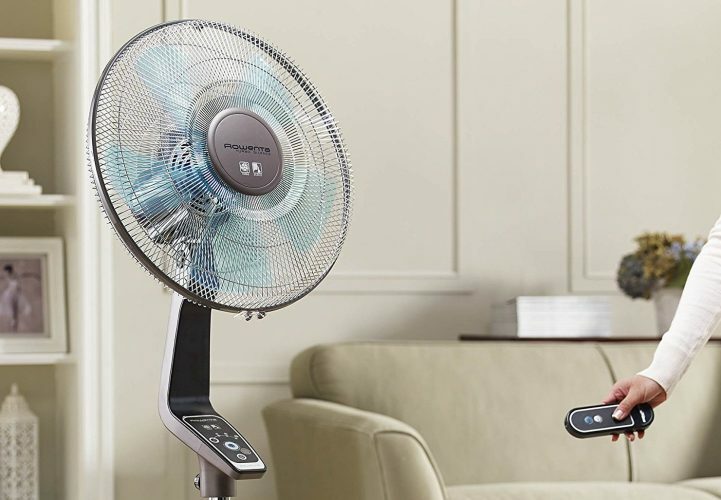 In this article, we’ve curated the quietest pedestal fans to give you quiet relief. We’ve selected a good range of fan types for you to choose from and reviewed each of them down below. While we recommend all of them – their functions and features vary from fan to fan. We’ve highlighted these difference in the pros and cons sections, to help you figure out the differences and find the best fan for your personal needs. Our top recommendation for you to check out is the Rowenta VU551. This ‘turbo silence’ fan has been designed with quiet in mind. It’s uniquely designed blades were purpose-made for strong but silent airflow, and it’s noise levels – equal to library ambience at low-medium speeds – have been proven by the manufacturer. Be warned, it is a bit pricey, but if you want the ideal quiet bedroom fan, you can’t get better than this. If you’re just looking for a simple yet quiet solution, then the Honeywell HS-1655 is a much more value-driven solution. Again, it’s also been designed with quietness in mind (it’s labelled their ‘QuietSet’ fan). While it does have a much lower price tag, all the functions you can ask for are still there: varying speeds, a remote control, and shut-off timer capability. While it’s not as fine-tuned or specialised as the Rowenta above, it’s a great solution if you’re simply looking for a quiet, capable fan. Custom designed for power and silence. This Rowenta model is what you would call a ‘luxury’ fan. While the price tag may not be what most people have in mind when they think about picking up a new fan, the quality speaks for itself. With 5 uniquely designed propeller blades firmly fixed to a study frame, this fan can effortlessly produce a strong amount of airflow with surprising little noise. The heavy frame works well to hold the fan down and prevent any rickety moving or swaying. 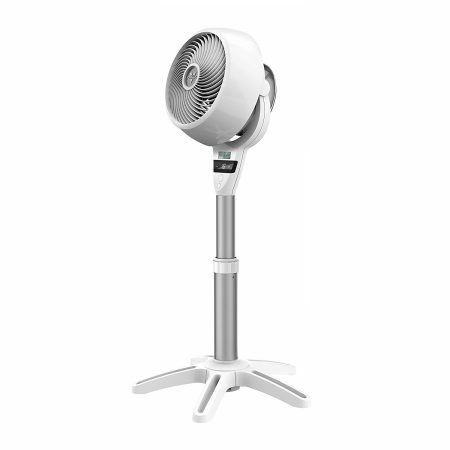 As a result, the fan head turns smoothly, quietly, and easily. Even when the blades are flying at the max speed, and in any direction (left, right, up, and/or down). You can also see the quality of the fan at first glance. For a common household appliance, this fan is a huge talking point for guests/visitors. Mostly while they appreciate how well it’s working! If you’re after a fan that guarantees strong air flow, quiet operation, and great build quality – then hands down, this is that fan. While it’s expensive, the custom-designed blades are almost silent at lower speed levels – and still quiet even at full power. Not only is it also a great talking point, but the sturdiness of the frame and the ease of cleaning it mean that this fan will keep you satisfied for years to come. It simply blows the competition away. Your own (touch sensitive controlled) mini-tornado. This Vornado fan was not a model we’d planned to include on this list. It’s not cheap, and it’s not designed with a special focus on quietness. However, to put it bluntly – it’s one hell of a fan. This thing is true to the name; packing the power of a mini tornado if you need to call on it. The fan works by spiralling the current of air it produces, which is intended to bounce off a surface in all directions – circulating air throughout the entire room at once. And it really works. One of the best parts is that since the air is flowing around the whole room, it’s not just one small focused area that’s receiving the cool air. This means no fights over the fan direction, and no constant fiddling with the oscillating direction to get things just right. Plus, the speed variability is on a whole other level. The fan’s speed settings range all the way from 1 to 99. Adjustable via touch sensitive controls, it’s effortless to get the power level just right. The build quality is also stellar. For such a quirky looking machine, the parts are all incredibly robust. But don’t just take our word for it – the model speaks for itself by having a 10-year warranty. If that isn’t a sign of manufacturer’s pride and confidence in their own product, we don’t know what is. For overall quality, you really can’t argue against this Vornado model. The 10-year warranty speaks for itself. There’s also so much air power packed into this fan, it’s so effective at quickly cooling down a room. Then with a few flicks on the touch-sensitive remote, you can bring the power down to a cool, quiet level. Unless you’re particularly after a traditional oscillating fan, we really can’t recommend this Vornado model enough. Amazon’s #1 bestselling pedestal fan – and for good reason. 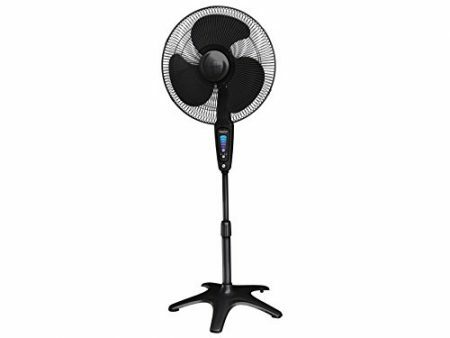 As the #1 Best Seller in Pedestal Fans on Amazon – this simplistic Lasko fan is proven to be outstanding if you’re looking for a simple yet effective pedestal fan. It’s large 18 inch fan gives that extra boost of air flow to provide extra cooling power. And with wide ranges of oscillation and tilt, you can get the air flowing exactly where you need it to. Part of the attraction of this fan is that it doesn’t come with a ton of extra features. It’s just a simple, well-built, efficiently functioning pedestal fan. That also means the price is also much lower than the it’s more function-loaded counterparts – making it ideal if you’re just looking for a simple fan solution that works. With this fan, Lasko have topped the Amazon best seller spot for Pedestal Fans. And for good reason. It’s simple, easy to put together and use, works fantastically and quietly – all for a great value price. Our top recommendation if you’re not after a fan that’s got more technology packed into it than some computers. Another great Honeywell product – designed for quiet operation and packing plenty of functionality. Designed with quiet operation in mind, the Honeywell HS-1655 is a great ‘entry level’ fan when it comes to the more advanced fans on this list. 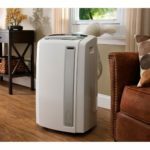 By entry level, we mean that it’s got plenty of great functionality tools, without the high price tag of the more custom designed fans (see the Vornado and Rowenta models on this list). 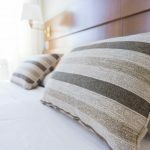 With wide ranges of oscillation and adjustable height, it can be made to suit any room – and the shut-off timer can help save on electricity by automatically switching off after a few hours (once you’ve fallen asleep). Plus, the included remote control means you can adjust any of these settings effortlessly. The fan itself packs plenty of power, and is surprisingly quiet while spinning away – even at full power. A great all-rounder. 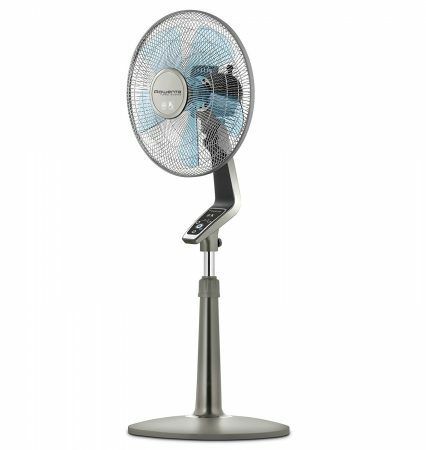 With a ton more functionality than a standard fan (remote control, shut-off timer, quiet design), but without the high price tag of a super-optimised pedestal fan, this model is a great solution if you want a high quality model that will keep you cool for years to come. Not the quietest. Not the cheapest. Not the lightest. But damn if these fans don’t look incredible! While we all know the importance of having a quiet fan to blow your hot worries away, sometimes you come across a product that you can’t not share. This range of fans is one of those products. 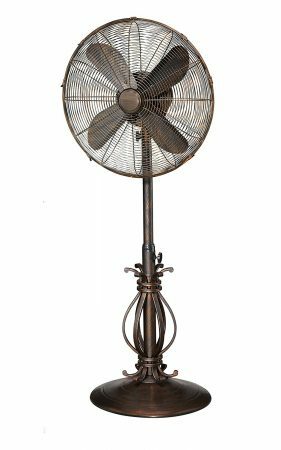 Designer Aire have come out with a range of pedestal fans that look like they’re straight out of movie sets. Now it must be said that they’re not cheap, or whisper quiet, but they do actually work well as fans and are more than capable of keeping a room cool. And we’ve not seen any other fan that will look quite as cool doing so as these. By the time you’re reading this text, you won’t need to read on any further. Either you’ll have fallen in love with the looks of one of these fans (in which case you’re probably half way to the check out line with it already! ), or you’re thinking “Are you crazy?! I want a quiet fan, not for my bedroom to look like it’s out of a Western!”, in which case, nothing we say will change your mind – you logical and thrifty person you. Whether it’s quietly keeping the room cool at night or strongly saying ‘no entry!’ to that hot afternoon air – we’re confident that each of these fans will leave you happier, cooler, and calmer. 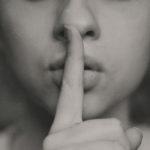 Each fan on our list has been curated down from the countless other products we reviewed; if a product is on our list, then it has our personal recommendation that it’ll be worth your hard earned money. If none of our top recommendations have caught your eye, then see if you can find more inspiration on Amazon’s bestseller list.